Add potatoes, carrots and green beans and cook for 5 minutes; drain and set aside. Heat olive oil in a medium skillet. Cut chicken breasts in half. Cook chicken breasts over medium heat for 5 minutes each side, or until no longer pink in the center. Add potatoes, carrots, green beans and all remaining ingredients to skillet, except 2 tablespoons lemon juice. Note: based on a recipe from Champions for Change. 621 members have added this recipe to their cookbook. Quick easy meal and it was YUMMY! I made this for my parents and I one night as a quick dinner, used all fresh ingredients and abosolutely got rave reviews. We really enjoyed the flavor combination. I used asparagus instead of the green beans. I also only par-boiled the veggies, then roasted them. WONDERFUL!! You put the honey in the ingredients list but they are no where in the directions. You did the same thing with the rosemary. Did you leave them out of the nutrition facts as well? This recipe is very dull, but at least it is healthy. Also, I recommend steaming the veggies instead of boiling them. Boiling them can easily make them soggy and they lose some of their nutrition and flavor. I really liked this dish. It had lots of flavor!!! This was delicious! although i'd never tried boiled fresh green beans before. im not really a fan of those. everything else was great though. but i bet butter would have made it taste awesome too haha. i added a little bit of salt to my veggies though. i took a picture of what i made but it doesnt look anywhere near as nice as the other photo does. haha. Wonder easy recipe. After adding the first half of the lemon juice I decided not to use the second half. Was enough lemon for me. Also left out the honey because, well, I forgot it. Was still wonderful and easy. Will be a regular meal! It was very tasty and easy to make. 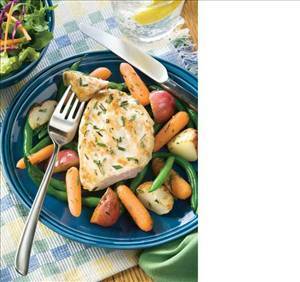 There are 244 calories in 1 serving of Rosemary Lemon Chicken with Vegetables. Calorie break-down: 22% fat, 38% carbs, 39% protein.